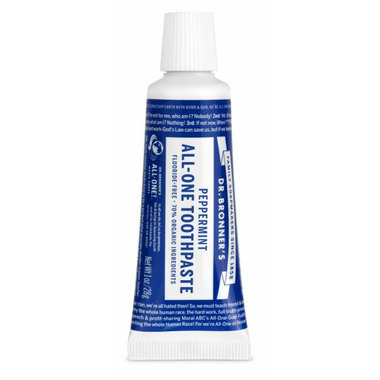 Dr. Bronner's Magic Soap ALL-ONE Toothpaste is made with 70% organic ingredients and helps to reduce plaque and whiten teeth. The low-foaming formula has no synthetic detergent foaming agents, is fluoride-free, vegan and cruelty-free, with no artificial colors, flavors, preservatives. This simple yet effective toothpaste stimulates mouth, teeth, gums and tongue, leaving them fresh and clean. Free of Egg, Dairy, Mustard, Peanuts, Seafood, Sesame, Soy, Sulfites, Tree Nuts Wheat/Gluten. Organic, GMO-Free, Vegetarian, Vegan, Fair Trade. So excited that my fav natural toothpaste comes in a travel size! It doesnâ€™t foam like regular toothpaste, but I donâ€™t miss that and it leaves my teeth clean & minty fresh!